At South Church we celebrate communion, also known as the Lord’s Supper, in accordance with Jesus’ command to “do this in remembrance of me.” Communion services are held on the first Sunday of each month and alternate monthly between morning and evening services. 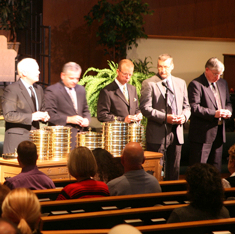 Those who have consciously turned from their sin and put their personal faith in Jesus Christ as Savior and Lord, are at peace with fellow Christians in a church that embraces the Gospel, and seek strength and grace to live more faithfully to Christ, are welcome to receive communion at South Church. "Feel free to contact me. I'm here to help you as you grow in your relationship with Christ and would love to help you find ways to worship, connect and serve."